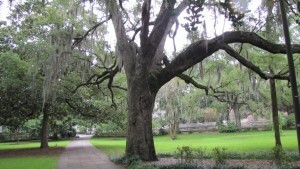 Savannah, Georgia boasts a wealth of history and Southern charm. 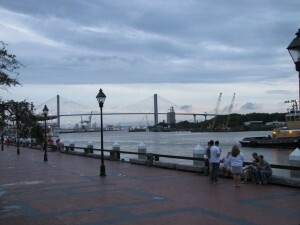 With several museums and art galleries, Revolutionary and Civil War sites, ghost tours, riverfront shopping and dining, one can easily keep busy for several days. The Andrew Low House, the birthplace of Juliette Gordon Low, founder of the Girl Scouts is also a popular attraction. There are various ways to discover the city, you can wander about on your own, join a walking tour, or sign up for a tour via segway, bicycle, trolley, carriage, water, even helicopter. Since we only had a couple days for our visit, we started exploring via a trolley tour, which was a good introduction to the city. The ticket allows you to hop on and off all day, and we discovered that the continuously looping trolley was a handy method of transport for tired feet (and to get out of the rain). 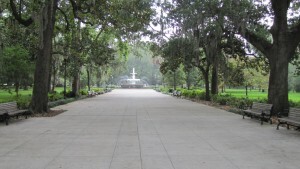 One of the trolley stops is at Forsyth Park, the largest park in the historic district. 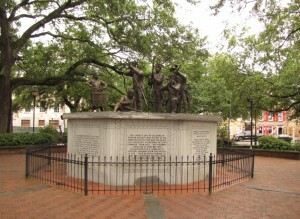 It is home to the Confederate War Monument, which is on the site where soldiers drilled before going off to war. 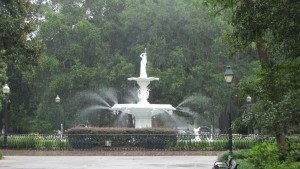 The park also features a large fountain (the water is dyed green each St. Patrick’s Day) and a bandstand at the Forsyth Park Cafe. Large expanses of grassy areas provide ample space for play and picnicking, or simply relaxing. Catholics (some were nobles fleeing the French Revolution) came to the area after an uprising in Haiti. 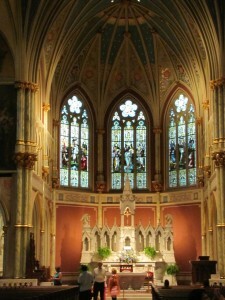 The Diocese of Savannah was established in 1850 and at that time, included all of Georgia and most of Florida. 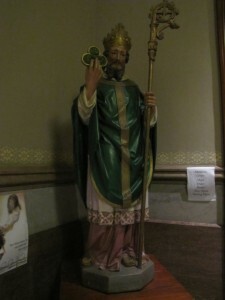 A statue of St. Patrick has a place of honor in the cathedral and his feast day is one of the largest celebrations in Savannah each year. We spent an evening wandering River Street, which has an interesting assortment of shops, while trying to decide on dinner. We had tickets for the trolley ghost tour, so a fancy sit-down place was out of the question. We found a small seafood place where I had an amazing oyster dinner. 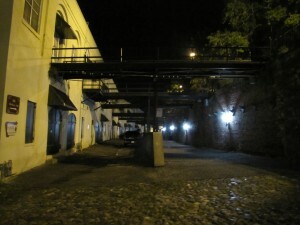 There are several ghost tours offered in Savannah, whose history would indicate the abundance of spirits. We chose to take the trolley tour (there was a package deal) and were entertained by our guide with stories of ghostly presence and more history of Savannah (she was especially concerned that a ghost not accompany us home as we were leaving one site on the tour). We didn’t make it to nearby Tybee Island, with its beaches, featuring birds, sea turtles, pirates and water sports. It is also home to a lighthouse, so we will be back! Independence National Historic Park is a must-see for visitors new to Philadelphia. 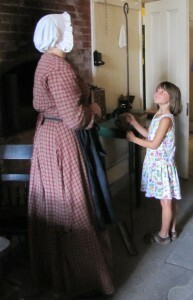 The area is rich in history and architecture and during the summer months, costumer interpreters bring history to life. One could easily spend a days exploring all that the area has to offer in depth, but a good starting point is the Independence Mall Visitor’s Center, a newer addition to the park which is free to the public (and the only place to get your free timed tickets to Independence Hall). 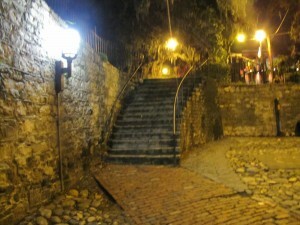 While here, you can also watch or two short films and get more information about the historic district of the city. Independence Hall was the location of the Second Continental Congress and the Constitutional Convention, and the place both the Declaration of Independence and the United States Constitution were signed, so it is a popular stop for visitors to the city. 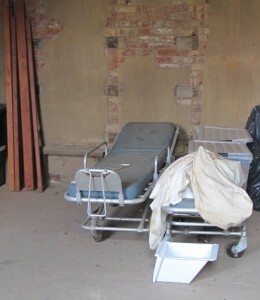 Park rangers provide information about the rooms and the artifacts contained within. Know your basic history, as some will test your knowledge while on the tour. During peak times, tickets “sell out,” so you will want to go early in the day to reserve your spot. 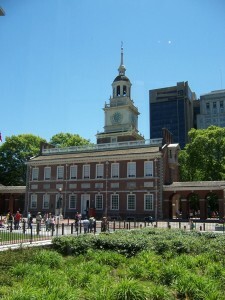 The grounds behind Independence Hall are quite pretty and a good place to stroll or sit and people watch. Between these two buildings is the Liberty Bell Center. Be aware that this is a popular location and the lines may be long. While waiting to see the actual bell, there is a short video and numerous displays about the bell and its history, as well as the history of our nation. I think it is worth going to see this, at least once, and have discovered with repeat visits (as the exhibits, as well as the bell’s location have changed over the years) that there always seems to be something new to learn. There are several other buildings in the Independence Mall area that are open to the public, including two that I missed seeing over the course of many visits. 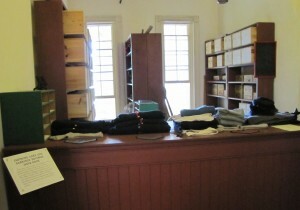 The Free Quaker Meeting House is a quiet place to stop and sit for a bit and if you time it right, learn more history. The site has varying hours, depending on the season. The “Free Quakers” who supported the Revolution separated from their pacifist Quaker brethren and founded this church in 1783. This is one of the sites around the park where you might find a costumed interpreter who will share information about the late 1700s with you. Carpenter’s Hall, which hosted the First Continental Congress and later Franklin’s Library, the American Philosophical Society and the First and Second Banks of America, is a little gem with many stories to tell. The history is detailed in a charming story written for young readers here. Franklin Court is where the home of Benjamin Franklin once stood. The surrounding buildings include the Franklin Court Printing Office, where you can learn about printing methods of the time, and hear about Franklin’s history as a printer. Recent years have revealed more about Franklin and a steel structure now outlines where his house once stood. The Franklin Museum explores Franklin’s life through hands-on exhibits and recovered artifacts. 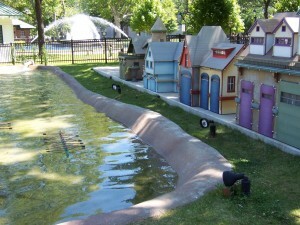 The mini golf course at Franklin Square features icons of Philadelphia in miniature. Here is Boathouse Row. There is much more to explore in the surrounding area. Other nearby buildings, such as the Betsy Ross House, the Declaration House (where Thomas Jefferson penned the Declaration of Independence) and Edgar Allen Poe house are also park of the National Park System. Franklin Square with its carousel and mini golf is just a few blocks away. Also nearby are the National Constitution Center and Christ Church Burial Ground (both charge fees, but are worth visiting). The Historic Philadelphia Gazette is a free paper that details each day’s happenings and there are multiple tour options of the city, by foot, trolley, horse drawn carriage, duckboat or Segway; many cater to specific interests. 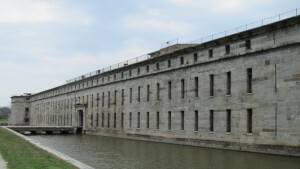 Fort Delaware, originally built to protect the cities of Wilmington and Philadelphia, is a Union fortress that once held Confederate prisoners of war. 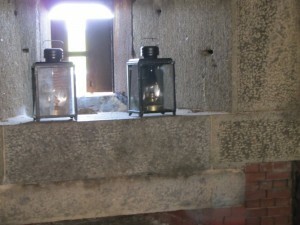 The fort, which dates to 1859, sits on Pea Patch Island in the Delaware River. The island is only accessible by ferry via Forts Ferry Crossing which runs from Delaware City, DE with tickets available on the day of visit at the park ticket office (first-come, first-served). 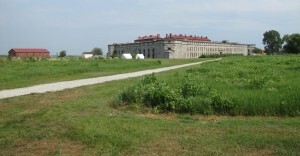 The park offers a number of activities, from birding (it is the summer home to nine species of herons) to hiking, (the Prison Camp Trail, is an easy 0.8 mile loop over grass and packed earth) to Living History events. 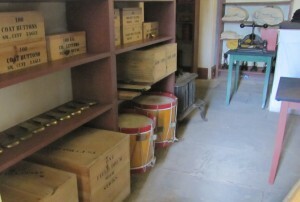 Visitors are free to walk throughout and around the fort and see numerous artifacts and reproductions of items that would have been in the fort over 150 years ago. There is a daily schedule of events with costumed re-enactors explaining life in 1864 with enough to see and do to keep you busy for much of a day. Visitors are welcome to ask questions and sometimes even to help with tasks. The order is given to fire (those with sensitive ears might want to cover them). 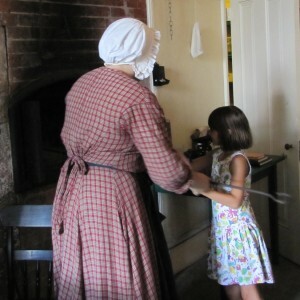 When we visited, we watched as soldiers fired a cannon, talked to a soldier about conditions in the barracks, learned how the women washed clothes, watched a blacksmith demonstration, helped in the kitchen and even practiced drill as enlisted soldiers. 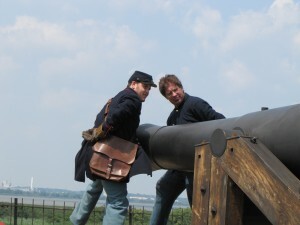 There is also the option to travel to Fort Mott, which is on the New Jersey side of the Delaware River. 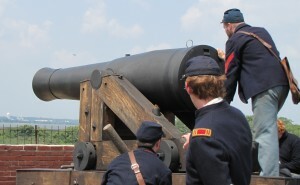 The fort was built up in the late 1800s in preparation for the Spanish American War, as part of a three-fort defense system, along with Fort Delaware and Fort DuPont in Delaware City. This 124 acre state park also offers picnicking, an easy walking trail and special educational events. There are no food vendors on the island, but packaged snacks are available in the gift shops. Picnic tables and grills are available if you choose to bring food with you.